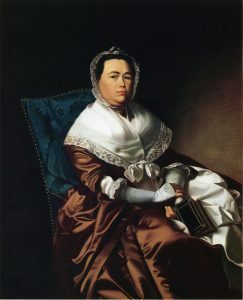 While I don’t know what Thomas’s father or mother looked like, his mother’s sister, Katherine (Graves) Russell of Charlestown, Massachusetts, was painted by John Singleton Copley around 1770. The portrait, at left, is in the collection of the North Carolina Museum of Art. Two days after leaving Boston, I spent all day at the Met with my husband and older son. We were among the very first to see their exhibit of Armenian art, and also saw a ton of armor, ancient Egyptian art, and early American paintings and furniture. Imagine my utter astonishment when I came across this portrait of Mrs. Sylvanus Bourne, painted in 1766 by Copley. Does it remind you of anything? I was stunned, and literally stopped in my tracks! 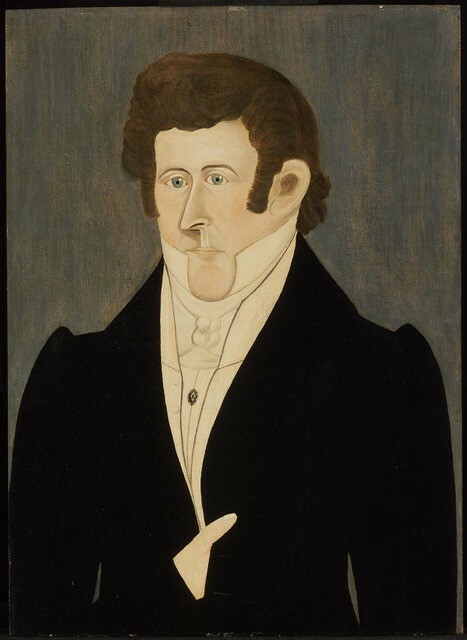 I knew that Copley often painted his subjects in dresses copied from other artists’ work (especially for his American customers who wished to be painted in fancier English fashions than they personally owned), but I didn’t know that he used the exact same pose for multiple sitters. It’s hard for me not to feel that one of these ladies got ripped off, and I think it was Thomas Cary’s aunt. 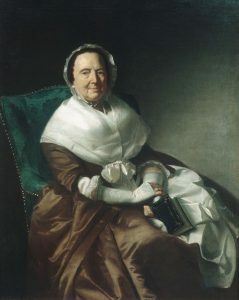 According to the portrait’s description, Mercy (Gorham) Bourne was born in 1695 and died in 1782, and sat for this painting three years after her husband’s death. The couple lived in the village of Barnstable, on Cape Cod, and had eleven children. To my eye, the nail heads on the chair look more differentiated in the portrait of Mercy Bourne; those in the picture of Katherine Russell are simple dots repeated at regular intervals. “Lazy painter!” was the comment of a friend who majored in art history. The museum’s website [www.mfa.org] states that it’s uncertain whether the name long attached to this painting is accurate, since no one bearing the name Tiffen appears in the census for East Kingston during the corresponding period. I have heard that itinerant painters often had a cache of portrait paintings (without faces) when they traveled from place to place. When someone commissioned a portrait they only needed to sit for the face to be completed. Very efficient. Perhaps this was done copying a Copley, or done by a student. Certainly merits more research. I admit that I am a fan of cheap pulp books from bygone eras. Doc Savage. The Avenger. Tarzan. etc. What amazes is the outright theft of 95% of the cover art, only replacing the hero’s head. Demand? Speed? Lazy? 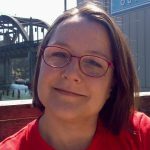 It’s not isolated – it’s frequent. The surnames “Tappan” and “Tilton” both appear in East Kingston, New Hampshire in 1820. I wonder if either are possible census taker misunderstandings of the surname “Tiffen”? There are several men in the immediate and adjacent counties with the surname Ellis. Just like the Roman statues, whose heads were added to previously fabricated sculptures of toga-clad bodies. Although one would have to study the pictures more closely than the blog images allow, I think Mrs Russell has fancier lace trim on her bonnet, shawl and sleeves. Definitely lacier…but the mitts, folds of the dress, contours of the chair, etc. are all pretty much identical!